On Saturday, we decided to try and clear up newer caches in Staffordshire. 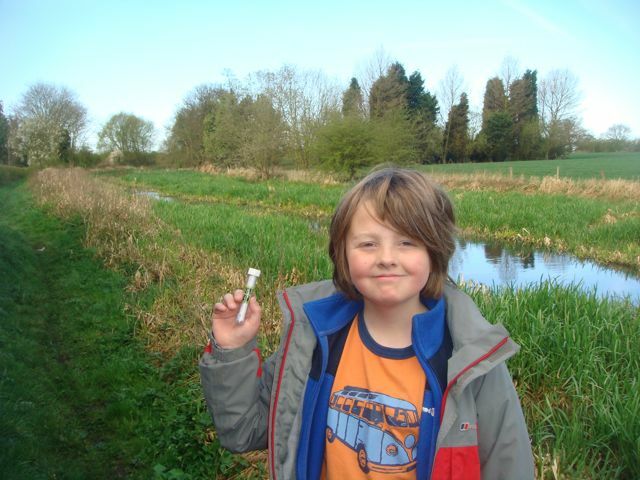 Isaac had been on a sleep-over at his Grandparents in Blymhill so it made sense to pick him up there and then start the day’s caching on the 6 caches that make up the Hatherton Canal series, near J12 of the M6. We parked up by the bridge near #1 and set off on our bikes. There were two very dodgy looking guys in combats nearby who were telling us about a sighting of a deer in the nearby field. They looked like they were out hunting rather than admiring the deer so we do hope the deer are still around to tell the tale. The canal series was nice and straightforward with some fun hides and nice scenery. The canal is disused and has been kept in a great condition, meaning there is tons of wildlife making it their home now. We did manage to pick up two punctures on the way back to the Jeep though. What is it with canals and newly cut hawthorn hedges :-(. Next, it was onto the M6 for the journey northwards just past Stafford and then cross-country to the Sandon Saunter series. This is a circular walk of 9 caches around the area at the back of the lovely Sandon Estate (home of two caches we adopted off MarcB – ‘The Urn’ and ‘Revelations’). As we set off, a farmer with a flock of sheep and newly born lambs was coming up the lane. We stopped for a chat and when he realised we were going where he wanted the sheep to go, he asked if we could herd them up into the field. The gate was shut behind us so the sheep could only go up the green lane and into the field. Isaac really loved this and took great pride in his herding :-). The series was nice and easy with quite a bit of terrain, which made for some excellent views over the area. On the way round we bumped into the Hide and Streets, some cachers from the Fenton area of Stoke-on-Trent. We stopped for a nice chat before going on our way as they were doing the series in the opposite direction to us. We bumped into them again later on in the walk and were able to help them with a cache they could not find, further round the loop. Next, it was a short drive up to Swynnerton, not far from J15 M6 and the ring of 12 caches there. We parked up to the south and set off to do them clockwise. The sun was shining and it was an absolute pleasure to be out walking in such lovely countryside. The series was soon completed with plenty of straightforward hides and one stinker of a hide with co-ords that were slightly off. Our only small grumble of the series is there were way too many micros in locations that could easily support *much* larger caches and there were some huge gaps between caches (half a mile on quite a few of them). Still, it’s a lovely walk and we didn’t mind too much. After that, we were getting hungry so headed off home, via the Co-Op in Eccleshall for a top up on drinks as we were looking forward to something ice-cold. A nice day out with lots of lovely walking and 30 finds in total.